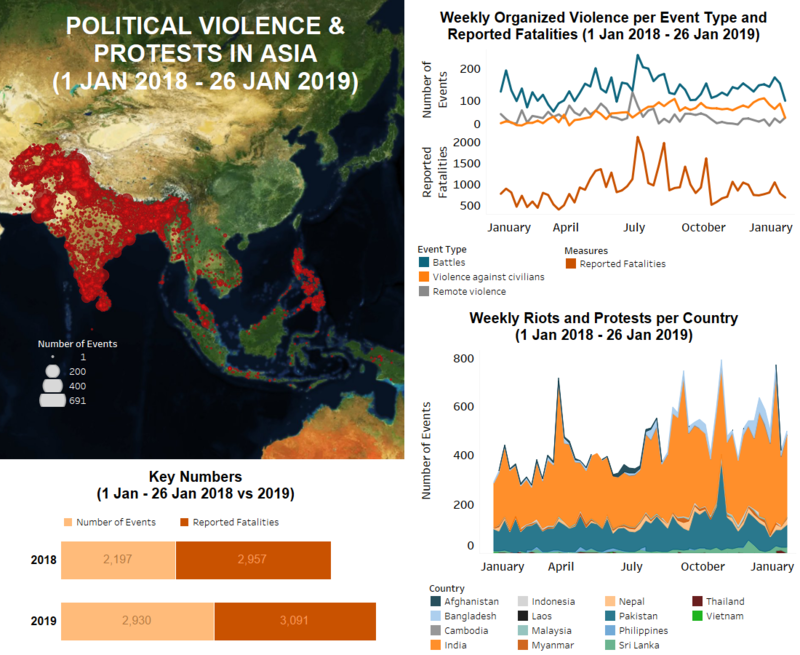 Last week in Asia, the overall level of organized violence remained relatively static while the number of demonstrations increased. In South Asia, the week was marked by a large-scale Taliban attack in Afghanistan and the reported deaths of 11 militants during Cordon and Search Operations by Indian forces in Jammu and Kashmir. In Southeast Asia, as the Bangsamoro Organic Law passed the first stage of the plebiscite in the Philippines, the military clashed with the Maute Group in the Mindanao region, leading to three reported deaths. In Afghanistan last week, fighting continued between multiple armed groups and Afghan/NATO forces throughout the country. The heaviest concentration of clashes occurred in the provinces of Helmand, Urozgan, Faryab, and Nangarhar – the latter of which being the Islamic State’s (IS) last remaining bastion in the country. However, an alleged rocket attack on the American Bagram airbase in Parwan province was claimed by IS via recent social media. This is only the second reported event by the group in that province since the beginning of 2017. NATO forces have targeted IS heavily in Nangarhar, so a retaliatory attack on a major airbase is possible. Meanwhile, on 21 January, a large-scale Taliban suicide attack on a National Directorate of Security (NDS) facility in Maidan Shar city, Wardak province, resulted in at least 44 fatalities, with some reports suggesting upwards of 100. The attack, which began with a suicide car bomb, destroyed a large part of the building that caused the majority of casualties when it collapsed. The compound was used as a training center for pro-government militia fighters (NY Times, 21 January 2019). This attack comes as peace talks were underway between the Taliban and representatives from the U.S. The talks, which exclude diplomats from the Afghan government, took place over six days last week in Doha, Qatar. While no official agreement has yet been made, the U.S. special envoy Zalmay Khalilzad commented that there was some progress. Major talking points included the withdrawal of American forces and assurances that the Taliban would not allow groups like Al Qaeda or IS to use Afghanistan as a base of operations (RFERL, 27 January 2019). In Pakistan, the Counter Terrorism Department (CTD) continued operations against militants in Punjab province. Last week, the CTD reportedly killed two militants belonging to an unidentified group during an encounter in Gujranwala city. In Khyber Pakhtunkhwa province, four incidents of IED explosions targeting security forces were reported, resulting in the death of two security personnel. The groups responsible for the explosions were not identified. In Sindh province, a Shia leader associated with the Shia Ulema Council was reportedly shot dead by an unidentified group, while a member of the Sindh Assembly and Pakistan Tehreek-i-Insaf (PTI) sustained bullet wounds in a separate incident. In other developments last week, demonstrations were reported across Punjab province against recent operations by the CTD in Sahiwal city, which, demonstrators allege, resulted in the extrajudicial killing of four people. Fewer incidents of cross-border violence and casualties were reported along the Line of Control, in the contested Kashmir region, last week. Nine incidents of cross-border clashes between Indian and Pakistani forces resulted in reported injuries to three Pakistani civilians and an Indian Army porter. No fatalities resulting from cross-border violence were reported. In India, 11 militants belonging to Al-Badr, Hizb-ul-Mujahideen and Lashkar-e-Taiba, among others, were reportedly killed by state forces during four separate Cordon and Search Operations (CASOs) in Jammu & Kashmir, prompting substantial anti-Indian protest and rioting activity. Militants also launched several attacks on Central Reserve Police Force camps (CRPF) and police/CRPF personnel on the eve of Republic Day, resulting in no reported fatalities. Elsewhere in India, violence between Maoist rebels and state forces continued with police operations in Chhattisgarh and Maharashtra resulting in the reported death of two Maoist rebels. Additionally, civilians accused of being police informants were targeted by Maoist rebels for the fourth consecutive week in January, with three fatalities reported following an attack in Maharashtra. Similar to previous weeks in January, demonstrations against the Citizenship (Amendment) Bill 2016 continued across northeastern states. The bill, which has been approved by India’s lower house of parliament, would grant residency and citizenship rights to non-Muslim immigrants. Opponents of the bill mainly criticize that legitimizing undocumented immigrants from Bangladesh will threaten indigenous communities (Al Jazeera, 8 January 2019). Significant protest activity was also witnessed across Tamil Nadu, where teachers took to the streets demanding pay on par with central government employees. Thousands of protesters were arrested across the state. 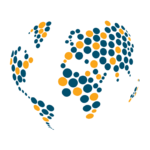 In Bangladesh, attacks by unidentified groups targeting political workers and current and former government officials resulted in the deaths of at least eight individuals across the country last week. Along the border with India, three Bangladeshi cattle traders were reportedly shot dead by Indian Border Security Forces. In contrast to previous weeks in January, only a few isolated protests and demonstrations were reported across the country. In Nepal, a shootout in Saptari district between police officers and assailants of Pragatishil Tarai Mukti Morcha, an armed Terai group, resulted in the death of one assailant. Meanwhile, Nepal’s parliament passed the National Medical Education Bill, though demonstrations continued following the parliamentary endorsement. Hundreds of medical students, civil society activists and members of various political parties demonstrated in Kathmandu city, and across Nepal, expressing dissatisfaction over the bill, which neglected to honor the agreement signed with Senior Orthopedic Surgeon, Dr. KC, regarding medical reforms in the country (Himalayan Times, 26 January 2019). An increase in protest activity was reported across Sri Lanka last week. Residents took to the streets denouncing the government’s failures, which included the provision of basic facilities, the resolution of cases of missing people, the release of prisoners, and the prevention of drug use and trafficking, among other things. Additionally, tea estate workers, with support from various groups, staged protests demanding an increase in wages. The first stage of the plebiscite for the Bangsamoro Organic Law was held on 21 January in the Philippines. While the law passed and will thus lead to the creation of the Bangsamoro Autonomous Region in Muslim Mindanao (BARMM), voters in Sulu province voted against the law. On 27 January, a bomb was set off in Jolo in Sulu province in front of a Catholic cathedral, reportedly killing at least 20 people. The bombing was reportedly carried out by Adjang-Adjang Group, a subgroup of the Abu Sayyaf (ASG), which has declared allegiance to the Islamic State (Asia Times, 28 January 2019). Earlier in the week, the military had also engaged with the Maute Group, another group with ties to the Islamic State, leading to three reported deaths. Violence in the southern Philippines is likely to persist despite the hopes for peace attending the Bangsamoro Organic Law vote. Separatist violence continued in southern Thailand last week when a bomb exploded in Yala, wounding six. As well, there was a demonstration in Bangkok by residents from Nakhon Si Thammarat who protested the construction of the Wang Heeb Dam. Notably, last week, DNA tests were released which proved that the two bodies found on the shore of the Mekong river in Nakhon Phanom province in December were those of two exiled activists associated with the red-shirt movement. The activists had disappeared from their place of exile in Laos in early December. Clashes continued in Myanmar in Shan state between the Restoration Council of Shan State/Shan State Army-South (RCSS/SSA-S) and the Shan State Progress Party/Shan State Army-North (SSPP/SSA-N). In Nay Pyi Taw, a rally was held by the Myanmar War Veterans’ Association in support of the military; the patron of the Myanmar War Veterans’ Association is the Myanmar military commander-in-chief Senior-General Min Aung Hlaing (The Irrawaddy, 23 January 2019). Meanwhile, farmers in Hakha, Chin state protested over the seizure of their land. In Yangon, nearly 1,000 workers marched to City Hall demanding changes to existing labour laws. In Cambodia, there were two demonstrations in Sihanouk province. In one, residents sought to prevent authorities from demarcating land. In another, nearly 300 villagers demonstrated against their eviction, leading to clashes with policemen. Several villagers were beaten, and some were arrested. As well, labour concerns led to a protest in Phnom Penh when over 400 garment workers from Long Victory International protested plans for the company to close. There were protests as well last week in Sabah and Sarawak in Malaysia. In Sabah, several people protested against a land grab attempt on property that had been purchased to build homes. As well, around 200 people protested to demand that a road connecting several villages be properly maintained. In Sarawak, a number of fishermen protested the government’s policy concerning foreign crew members. No political violence or protest events were recorded for Indonesia, Vietnam or Laos last week. Danyal Kamal is an Asia Researcher with ACLED. He received a B.A. in General Management from Michigan State University, with a specialization in International Business. Mr. Kamal has research experience in the fields of minority rights, misgovernance and radicalization, tax policy and enterprise development, and public policy. 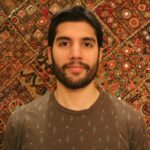 Mr. Kamal is currently based out of Islamabad, Pakistan, and is fluent in English and Urdu.